It is no secret that I love tonkatsu. Sushi and sashimi are great, but if I had to choose, I would go for tonkatsu anytime. So when I was in Tokyo last year, I made it my mission to find the best tonkatsu in the city. 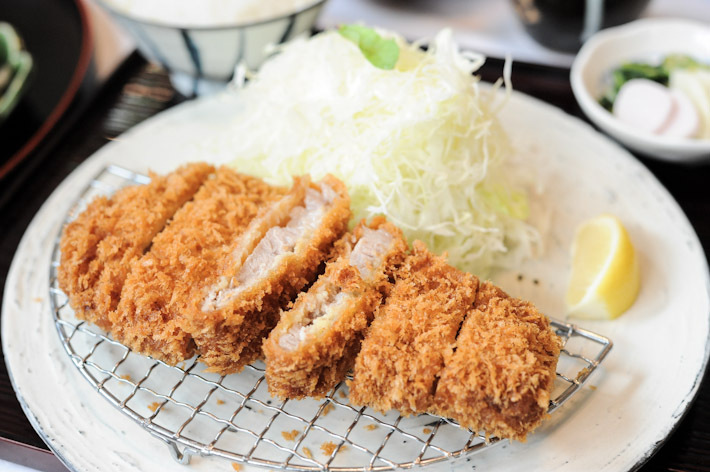 There are many famous tonkatsu restaurants in Tokyo, but the place that everyone seems to agree is the best place to head to is Maisen Tonkatsu. They have many outlets in Tokyo, but go to the main shop in Aoyama – just a few blocks behind Omotesando Hills. The restaurant is located in a former World War II public bathhouse, which adds to the whole feel of dining there. There are many options on the menu, but if you are there, you must go for the best – its famed Okita Kurobuta Fried Pork Loin meal (3,780 Yen). The tonkatsu, like the reviews that I have read, was really good. In fact, it was one of the best I have ever had in my life. The pork cutlet was extremely juicy and crispy, yet not greasy at all. Topped with their special tonkatsu sauce, and served with a bowl of rice and a large stack of cabbage, it was unbeatable. My only gripe was that the tonkatsu set costs 3,780 Yen or S$50 – which was quite painful on the wallet. The Kurobuta Fried Pork Cutlet on rice set (1,580 Yen) was also worth a mention. The katsudon was lovely, and it made me wish that Maisen Tonkatsu would open a shop in Singapore so that I could have it on a regular basis. If you are a tonkatsu fanatic like me, you would not want to miss this restaurant. If I’m not wrong, Maisen has come to Singapore! Specifically, Mandarin Gallery. Tonkatsu is one of my favourite foods in the world and I was blown away by the quality at Maisen. It truly is deserving of its reputation. Great write up. Thanks for sharing. We were at Maisen last week and it was super!.